Egyptian President Abdel Fattah el-Sisi, Saudi King Salman, U.S. first lady Melania Trump, and U.S. President Donald Trump visit the Global Center for Combating Extremist Ideology in Riyadh, Saudi Arabia, May 21, 2017. Battlefield victories will prove short-lived without a more focused strategy to tackle terrorist ideology. When President Donald Trump took office in January, he inherited a military campaign against the Islamic State and Al Qaeda affiliates in the Middle East that had yielded impressive gains in Iraq and, to a lesser extent, in Syria. Since then, the Trump administration has largely continued to rely on President Barack Obama’s counterterrorism strategy of working through partners in the region. However, the strategy to counter the spread of violent extremist ideologies that give rise to terrorism remains a work in progress. Initial steps by the Trump administration give cause for concern. Countering violent extremism (CVE) is a relatively new field. It was first incorporated into official U.S. national security strategy in 2006.1 The challenges CVE seeks to address are more diverse and intangible than those targeted by the traditional tools of counterterrorism. According to the U.S. Department of Homeland Security, “CVE aims to address the root causes of violent extremism by providing resources to communities to build and sustain local prevention efforts and promote the use of counter-narratives to confront violent extremist messaging online.”2 Yet there is little consensus on what constitute the key drivers of extremism. The effectiveness of various interventions also remains a subject of significant debate. After more than a decade, efforts to counter the ideology of terrorist networks by the United States and its partners have yet to accrue a tangible return on investment. Following the 9/11 attacks, the George W. Bush administration linked its global war on terrorism with its freedom agenda, an effort to promote political reform in the Middle East. These efforts failed to produce greater overall stability in the region. Nor did they lead to significant advances in democratic development or major achievements in the battle against violent extremism. This report assesses opportunities to strengthen CVE initiatives in the Middle East. It explores the state of current CVE efforts in Saudi Arabia, the United Arab Emirates (UAE), Egypt, Morocco, Jordan, and Tunisia. These countries are among the United States’ closest partners in the region. Their experiences in CVE to date reflect what remains a deeply contentious and controversial field. Their success going forward in the battle of ideas will determine whether America can turn battlefield success against terrorist organizations into lasting victory. Additionally, the report argues that the Trump administration should pursue an indirect strategy that seeks to strengthen the capability of U.S. partners in the region to counter violent extremism. The administration should discourage these partners from adopting an overly securitized approach to CVE. It should also channel resources through multilateral initiatives, prioritize the identification of local drivers of violent extremism, and take a more rigorous approach to evaluating the impact of CVE programming. Finally, the administration should refrain from rhetoric and policies that exacerbate the problem instead of contributing to the solution. Make the case to partner countries that repressive policies are counterproductive, and encourage leaders to support basic freedoms and respect for pluralism and inclusivity. Support the adoption of national CVE strategies, prioritize monitoring and evaluation mechanisms, and promote research to identify local drivers of violent extremism. Invest in multilateral organizations and initiatives such as the Global Counterterrorism Forum (GCTF), Hedayah, and the Ideological War Center. Abandon Islamophobic and inflammatory rhetoric. Although President Trump has been in office for little more than six months, three trends detailed below have emerged in his approach to violent extremism in the Middle East. President Trump’s first trip to the Middle East sought to unite regional governments in combating extremist ideology. However, the president also signaled to the region that freedom and human rights, bipartisan tenets of American foreign policy, are no longer a priority for his administration. Indeed, during his visit to Saudi Arabia, Trump remarked, “We are not here to lecture—we are not here to tell other people how to live, what to do, who to be.”5 This statement and others like it were widely perceived as a break from previous American leaders’ efforts to promote American values in the region. In making this remark, the president signaled that America would no longer hold regional partners accountable for domestic repression. Regional governments have often used securitized and repressive measures to address extremism, including censorship, overly broad counterterrorism laws, and bans on political activity. There is a real danger that such measures will worsen the societal fissures in which extremism thrives.6 In addition, the Trump administration’s passive response to this approach risks implicating the United States in Middle Eastern citizens’ grievances against their rulers. Trump’s fiscal year 2018 budget proposal leaves intact most of the State Department’s CVE program funding—in contrast to many other programs the administration proposed to gut.8 However, Secretary of State Rex Tillerson has not submitted a request for $60 million of 2017 international CVE funding earmarked for the State Department’s Global Engagement Center (see the text box below).9 If not transferred to the State Department by September 30, the funding will expire and leave a substantial gap in U.S. efforts to work with partners on countering violent extremism. 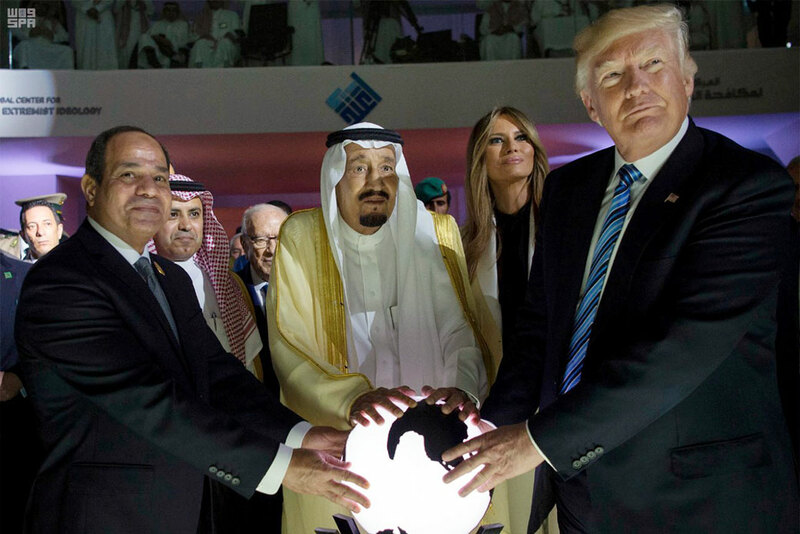 During a trip to Saudi Arabia in May, President Trump inaugurated the country’s new Global Center for Combating Extremist Ideology, called Etidal in Arabic.10 The center is slated to conduct counterextremist messaging online and in the media. To date, however, the administration has not demonstrated any substantive support or follow up for the initiative. It is also not clear how Etidal will coordinate with the many existing multilateral institutions already doing this work—many of which are led or funded by the United States (see the text box below). According to U.S. officials, interventions that they term “made in America” are likely to lose legitimacy among the target population.11 It is therefore essential that the United States coordinate with and work through its allies and partners, especially those in the Muslim world. To this end, the United States has made significant investments in multilateral CVE programs and initiatives, including those described in the text box below. A key goal of these efforts is to develop a shared understanding of violent extremism in the Middle East based on analysis and research. Promoting CVE policies that embrace pluralism and tolerance through multilateral initiatives was a core concept of the Obama administration’s approach to CVE. In September 2014, President Obama addressed the U.N. General Assembly to urge unified, global participation in CVE. In September 2015, leaders from more than 100 countries, 20 multilateral bodies, and 120 civil societies and private-sector organizations participated in a summit to affirm their commitment to CVE and coordinate preventive strategies. By contrast, the Trump administration has so far pursued counterextremism on an ad hoc, bilateral basis. This approach selects partners and tactics in response to immediate challenges, rather than addressing underlying structural drivers through existing institutions. The Trump administration’s warm relations with Muslim leaders stands in tension with its inflammatory rhetoric and policies against Muslims in the United States. During his first weeks in office, Trump issued an executive order banning travel from seven Muslim-majority countries, which was widely perceived as a “Muslim ban.”20 In addition, the administration reportedly intends to rebrand countering violent extremism initiatives as “Countering Islamic Extremism” initiatives.21 Furthermore, Trump’s statements, and those of some of his key aides, denigrating Muslims and Islam have been widely covered in the Middle East and negatively affect the popular perception of the administration in the region. The impact of these actions is already being felt. Recent polls show extremely low confidence in the Trump administration among Arab populations. In Jordan, Tunisia, and Lebanon, confidence in President Trump is significantly lower than confidence in President Obama at the end of his term. Additionally, those polled in these countries overwhelmingly described President Trump as “intolerant” and “dangerous.” The majority of survey respondents in Jordan and Lebanon expected that relations between the United States and their countries would get worse during President Trump’s tenure.22 This lack of trust in the administration undermines the United States’ partnerships and legitimacy in the region. For more than a decade, several key countries in the Middle East have developed programs and adopted new approaches to address the challenges of extremist ideologies. These programs and their impact have varied considerably. Many national-level CVE initiatives in the region suffer from the same set of weaknesses. But their existence demonstrates a recognition in the region of the widespread problem. An overview of these efforts is presented below. The proliferation of CVE programs in the region signals increased attention to the challenges, but many of these programs have not produced significant results and are riddled with weaknesses. A new approach should integrate efforts to shore up common weaknesses, as well as build on existing strengths. Most of the countries reviewed in this report prioritize some form of religious intervention to counter the spread of violent extremist ideology. Additionally, many interventions examined here are state-owned and often restrict political freedoms. In doing so, most undervalue civil society’s potential to complement governmental efforts in CVE. However, there are unique elements in the approach of each country that reflect national experiences and histories. Two key centers of gravity in the fight against extremist Islam are in Saudi Arabia and Egypt. Saudi Arabia is uniquely situated in the broader ideological battles within the different schools of thought in Islam, given that it is the birthplace of the religion and its unique role as “custodian of the two holy mosques” in Mecca and Medina. For centuries, Egyptian religious institutions have heavily influenced Muslim thought and Islamist ideology, with Egypt’s Al-Azhar University serving as one especially influential forum. The UAE’s involvement in CVE reflects its significant interest in combating extremism, as it defines the term, to ensure stability at home and diminish threats arising from political Islam to both security and stability. The country has initiated a number of new activities in partnership with other countries and international organizations such as the United Nations. Tunisia has prioritized the role of civil society organizations in the response to violent extremism. Unlike other countries in the region, Tunisia has avoided a totally government-owned and implemented effort. In Morocco, the king enjoys an important degree of religious legitimacy, which lends credibility to the country’s efforts to contain the influence of radical clerics.23 Jordan has pursued a primarily state-led strategy that includes a mix of counter-messaging and religious scholar training, but it is increasingly working with the U.N. Development Programme (UNDP) and international nongovernmental organizations to expand its CVE programs. The major weaknesses of existing CVE efforts in these countries are described below. An overview of each country’s CVE programs is available in Appendix I. They provide a public commitment by a state to counter violent extremism. They establish a framework to organize and coordinate efforts. They set out goals and objectives that can be measured and evaluated. They can provide greater opportunity for civil society participation. Few, if any, CVE interventions in the region are grounded in robust data or analysis of the drivers of extremism. Robert McKenzie, a former senior adviser for CVE at the U.S. State Department, concludes that “efforts are mostly designed and funded on the basis of anecdotal evidence, with unknown results.”24 The effectiveness of all existing scholar-led initiatives is uncertain due to the lack of transparency and accessibility of data in these countries. Most regional countries prioritize religious interventions of some form without a strong analytical basis for understanding the role played by religion. In addition, governments often blame what they term “incorrect” interpretations of Islam without pointing to a commonly agreed upon “correct” interpretation. This results in lack of unity and contradiction—between, for example, religious authorities in Saudi Arabia and Morocco—that undercut CVE efforts. Overall, none of the programs in these six countries include clear evaluation methods to determine the effectiveness of their interventions, and none provide numbers that can be independently verified. This makes it difficult to identify the strengths of existing CVE initiatives and recreate them on a larger scale. There is evidence to suggest that some governments in the region have progressively securitized their approach to countering extremism during the first six months of the Trump administration. This includes the use of heavy-handed counterterrorism tactics and political repression. Relying primarily on security interventions risks obscuring other possible drivers of violent extremism, including poor governance structures and a lack of economic opportunities. A key figure in Salafi-jihadi history and jurisprudence is Abdullah Azzam.33 A Palestinian cleric, Azzam became a global recruiter for Afghan-Arab jihad against the Soviet Union. Salafi-jihadis previously conceived of jihad as a struggle against internal, intrastate enemies. The Soviet occupation of Afghanistan, however, reframed jihad as a struggle against external adversaries.34 With Osama bin Laden, Azzam founded Al Qaeda, a base from which to execute jihad. After Azzam’s 1989 assassination, bin Laden and the Egyptian Ayman al-Zawahiri inherited Azzam’s global jihadi networks. While bin Laden and Zawahiri directed Al Qaeda’s strategy and tactics, Azzam remains an influential figure in Salafi-jihadi thought. Pluralism and tolerance are essential in the fight against extremism, especially in the Middle East.40 As such, the Trump administration should leverage its relationships with regional leaders to push back against repressive policies. The administration should put forward an affirmative agenda that links basic freedoms to the fight against extremism. These issues should also be raised regularly during meetings with regional leaders and through existing strategic dialogues. Congress should also elevate issues of pluralism and inclusivity, especially where the administration fails to give them the necessary attention. Congress should call for hearings in response to repressive policies and actions that could encourage—rather than counter—violent extremism. This should include hearings on relevant issues identified by the State Department’s annual reports on human rights and religious freedom. If current trends continue, Congress could also consider legislation that prohibits assistance or arms sales to countries that use counterterrorism laws to suppress opposition and minority voices. The Trump administration should leverage better relations with regional partners to encourage the development of national strategies.41 National strategies should be led by governments but engage civil society organizations, community leaders, local municipality officials, academics, and other relevant stakeholders. The administration should also privately convene leaders from the region to coordinate on CVE. Where countries have shown a willingness to develop national strategies, the United States should support a comprehensive approach that goes beyond an exclusive focus on security tools and state control. Governments should be encouraged to make strategies as inclusive as possible and to share knowledge and lessons learned. The United States should encourage transparency both in planning and implementing CVE programs. By supporting publicly accessible evaluations, the United States can highlight gaps in regional efforts, improve understanding of local drivers of violent extremism and the tactics used to combat them, and strengthen national and international faith in implemented programming. Government-led initiatives may be viewed with suspicion in the region. Furthermore, in the view of one Middle East expert, “The U.S. flag is a problem; it immediately delegitimizes the effort.”45 Accordingly, there are significant advantages to working through multilateral initiatives and mechanisms such as the Global Counterterrorism Forum, Hedayah, and the RESOLVE Network. GCTF has already disseminated a number of best practice memorandums on CVE. The field, especially in the region, is desperately in need of a CVE clearing house that collects, analyzes, and disseminates information related to interventions.46 Hedayah could be encouraged to play that role. The president and his team should work to correct the lingering damage of its Islamophobic rhetoric during the campaign. Administration appointments and public statements are two major areas that require prompt attention. American diplomats in the region should engage publicly in a way that emphasizes America’s enduring pluralistic values and constitutional traditions. The administration should avoid making reckless decisions and statements that affect CVE work and relations with the governments highlighted in this report, including policies such as the travel bans. Such words and deeds feed into a clash of civilizations model that can inflame public opinion in the Muslim world and harm regional efforts to counter violent extremism. Countering violent extremism must remain a top priority for the United States and its partners in the Middle East. The United States should continue to play a role in guiding, funding, and developing data-driven CVE strategies that do not lean on repression or counterproductive policies. To that end, the Trump administration should work quickly to reshape its current approach to CVE by abandoning harmful rhetoric and emphasizing thoughtful strategies that uphold American values of political openness, pluralism, and inclusivity. It should also publicly demonstrate its commitment to working through multilateral institutions and partners to build and improve the quality of existing CVE programming that has been developed by Middle Eastern countries since 2001. The following appendix is a breakdown of key elements of CVE programming in Saudi Arabia, the United Arab Emirates, Egypt, Morocco, Jordan, and Tunisia. Its objective is to provide background on the threat that violent extremism poses in each of these countries, their governments’ perceptions of the threat, and the types of initiatives implemented to counter the threat. A majority of the initiatives launched in the region prioritize religious interventions but risk neglecting other drivers. Programming also suffers from overt securitization and politicization, potentially exacerbating existent grievances. Aftercare: This component aims to reduce recidivism. Released detainees are transferred to an external rehabilitation facility to ease their transition into society. Support continues even after release in the form of employment assistance; a selection of benefits, including housing; and even financing marriage costs. Saudi Arabia has missed several self-imposed deadlines for curriculum review, an important element of CVE in the country, since 9/11, and its current status is unknown. Furthermore, Saudi authorities do not provide their data for transparent evaluation by outside experts. This in turn makes it difficult to assess the high success rates claimed by the government. The rise of extremism in the region over the past several years has led the UAE to mobilize its considerable resources toward a two-pronged strategy that includes support for anti-Islamist forces and the establishment of an international network of organizations working to undermine the intellectual and theological foundation of extremism. Notably, the UAE believes that Islamists “inevitably stoke the slow but sure radicalization of society.”52 In November 2014, the UAE designated the Muslim Brotherhood and nearly all its affiliates as terrorist organizations.53 The designation was followed by arrests, trials and sentencing, and other measures that suggest a security-heavy, zero-tolerance approach. Facing a low-level insurgency and incitement by some Brotherhood members, the government has bet on “the utility of brute force to nip the insurgency in the bud”56 without providing a “convincing strategy to stem the tide of extremism,”57 according to the Carnegie Middle East Center. Beyond security, the government has presented a disparate set of religious and educational initiatives to counter violent extremism. The Mohammed VI Institute trains women as morchidates, or religious community leaders.63 By focusing on women, the program views them as essential in countering violent extremism within families and communities. While the goals of Morocco’s program are laudable—especially compared with its regional peers—it too suffers from the absence of transparent and accessible data, making it difficult to evaluate its overall success. Information on the success rates of de-radicalization programs in Jordan are hard to come by. Overall, signals from the Jordanian government, including the establishment of the Directorate of Combating Extremism and Violence and its partnership with the UNDP, suggest a welcome commitment to establishing a comprehensive approach for countering violent extremism. In 2014, an attempt to create a national strategy on violent extremism failed. However, it registered notable progress by outlining broad strategic principles, including: balancing security and human rights, sustaining political consensus, strengthening regional cooperation, and adapting to evolving jihadi threats. A 2015 document, drafted by the National Commission Against Terrorism and Violent Extremism, proposed an approach based on the four pillars of prevention, protection, prosecution, and response but was not formally adopted. Tunisia’s fragile transition and rapidly evolving security climate have contributed to the spread of violent extremism in the country. The dictatorship’s legacy of marginalizing mainstream religious organizations and scholars, the ongoing border crises, and overall economic hardship necessitate an all-of-the-above approach. The government appears to be mounting a holistic response involving multiple state institutions and civil society actors—a novelty among regional CVE efforts. Hardin Lang is a senior fellow at the Center for American Progress, where he focuses on U.S. national security and multilateral affairs, Middle East policy, and the role of Islamists in the region. He comes to the Center with 18 years of experience in peacekeeping, peacebuilding, and stabilization, including a 12-year career with the United Nations. Most recently, Lang was a senior fellow in the international security program at the Center for Strategic and International Studies. During his tenure at the United Nations, he served as head of office for former President Bill Clinton in his role as U.N. special envoy for Haiti, helped launch the U.N. stabilization in Mali, and managed peace operations in Afghanistan and Haiti. Other foreign deployments include a tour as a senior adviser to the U.N. special representative to Iraq and two years in the Balkans, where he helped draft Kosovo’s first interim constitution. He spent the first three years of his career in Central America working as a human rights advocate, before joining the international verification mission in Guatemala charged with overseeing an end to that country’s civil war. Lang has led teams of international observers to monitor elections in Afghanistan, written for the Economist Intelligence Unit and Foreign Policy, and appeared on the BBC, NPR, and Fox News. He is on the advisory board for Building Markets, a nongovernmental organization dedicated to creating jobs in conflict-prone countries. Lang holds a master’s degree in public policy from Princeton University’s Woodrow Wilson School of Public and International Affairs and a master’s degree in international history from the London School of Economics. Kristy Densmore is a former intern on the National Security and International Policy team at the Center for American Progress. She is a recent graduate of The George Washington University with an Master of Arts in security policy studies from the Elliott School of International Affairs. Her work focuses on nonstate actors, risk analysis, and transnational security issues.